Awareness and education can prevent a life-threatening emergency. Sepsis is arguably one of the least-talked about—and least-recognized—illnesses in the United States. But each year, roughly 1 million adults in America develop the condition, and nearly 270,000 die as a result. For older adults, the statistics are even more staggering: 65% of sepsis cases in American hospitals involve older adults. Sepsis is a potentially life-threatening condition caused by the body’s response to infection. This complication of infection is characterized by a systemic inflammatory response that produces symptoms such as low blood pressure, dizziness, fatigue, and chills. Typically, the first recognizable sign of sepsis is fever, though this can differ among older adults. Sepsis is generally diagnosed through blood and urine tests, and additional tests may be used to determine the source of the infection. For example, sepsis as a result of pneumonia may warrant chest X-rays, but sepsis as a result of meningitis may warrant a CT scan of the head. As soon as sepsis is recognized, a course of antibiotics will be started. Any infection can put an individual at risk of developing sepsis. Though no one is immune to developing sepsis, older adults in long term care or in hospitals are at a greater risk. Molander adds that stroke patients, common among the elderly population, are also at a higher risk for sepsis. “If an elderly person is incapacitated after a stroke, they are at a higher risk of skin infections, as they cannot move their limbs and thus are at a higher risk for bedsores to become infected,” she explains. After a stroke, Molander explains, patients may also have a weakened ability to swallow effectively, so they are at higher risk of choking and aspirating food or saliva into their lungs. This puts them at increased risk of lung infections. Some elderly patients, due to dementia or stroke, may be unable to communicate to their treatment teams that they’re not feeling well or experience burning with urination. Thus, the infection in the bladder is not recognized until a fever and confusion have already developed. At this point, sepsis may have already started. Individuals in close quarters, such as those in long term care, Molander says, are also at higher risk for outbreaks of infection that spread from one patient to the next. Al Cardillo, president and CEO of the Home Care Association (HCA) of New York State, who spearheaded the implementation of a first-of-its-kind home care system for sepsis prevention and management, says that the home care population inherently embodies high risks of sepsis. “Statistics show 80% to 90% of sepsis cases originate in home and community [long term care],” Cardillo says. “Sepsis is the No. 1 all-cause for Medicare and Medicaid 30-day hospital readmission in New York state.” A recent Centers for Medicare & Medicaid Services study shows sepsis has a greater impact on hospital readmission, increased lengths of stay, and increased medical costs than do acute myocardial infarction, heart failure, COPD, and pneumonia, he explains. The most common infections in long term care facilities leading to sepsis include pulmonary, urinary tract, and abdominal infections, though the elderly can also get sepsis from influenza or surgical sites due to their weakened immune systems, Molander says. Studies show that sepsis is associated with significant morbidity and mortality if not promptly recognized and treated, so early detection is critical. However, most Americans know very little about sepsis and therefore fail to recognize the symptoms. More concerning is that many providers also are not well versed about sepsis and treatment protocols. One key difference in older patients, according to Roberts, is that they may not present with a fever, or, if they have a fever, it’s low grade. While a younger patient would develop a fever, this response may be delayed or absent in an elderly patient. Sepsis commonly presents with systemic manifestations including hyperthermia or hypothermia, tachycardia, tachypnea, acute mental status change, leukocytosis or leukopenia, and hyperglycemia, Roberts says. New or worsened organ dysfunction signs include hypotension; increasing oxygen requirements; elevated lactate, creatinine, or bilirubin levels; thrombocytopenia; and coagulopathy. 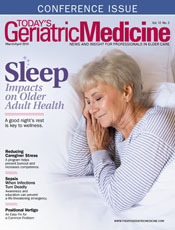 Another issue delaying detection specific to long term care is that those most likely to be at the bedside most often may not have a significant amount of training in health care. “It may be a certified nursing assistant that is spending the most time with the patient,” Roberts says. “While they may not be able to articulate this is sepsis, they likely will notice something is wrong or just not quite right with the patient.” One of the most valuable lessons Roberts has learned is to listen to those who spend the most time with patients. It’s crucial, too, “that this population of workers knows how important it is to be forthcoming when they know something isn’t right. And it’s imperative that the licensed staff listens to them,” she adds. One of the most effective steps in recognizing sepsis early is to screen patients frequently for signs, Molander adds. Considering that certified nurse assistants in long term care facilities might observe symptoms of sepsis first, another key piece of the puzzle is listening to their concerns, Roberts says. She also suggests making a point of periodically meeting with therapists, environmental service workers, and dietary workers to discuss what they observe in their patients. It’s important, she says, to keep the channel of communication open and follow up when staff members have concerns. According to Molander, sepsis, as soon as it’s identified, should be treated as a medical emergency as quickly and efficiently as possible, with a rapid administration of antibiotics and fluids. A study published in Critical Care Medicine found that the risk of death from sepsis increases by an average 7.6% with every hour that passes before treatment begins. Molander says the first course of antibiotics given are generally broad spectrum, effective against several of the most common types of bacteria. These antibiotics are given intravenously to get them into the blood system quickly. Of course, it’s ideal to prevent a patient from ever reaching this point. The key to preventing sepsis is preventing infections, Roberts says. This means following infection control recommendations including practicing good hygiene, especially good hand hygiene; practicing respiratory hygiene including cough etiquette; implementing device-related bundles; ensuring residents receive recommended vaccines; participating in proper wound care; and educating patients and families. Putting better practices into place is also a key to prevention. Molander says that having all care providers get their annual flu vaccine is important. It might also be valuable to consider a policy of not accepting sick visitors into long term care facilities. Molander points to a survey by the Hospital Quality Institute of patients who’d recently been hospitalized with sepsis that found more than 50% of these patients and their families were unaware that they’d been diagnosed with sepsis. “So, we as providers need to continue to improve our patient and family education and prepare families for what to expect,” he says. Cardillo is among those advocates for vital changes. The HCA has been a pioneer for home- and community-based care in New York State that under Cardillo’s direction has been increasingly focused on this issue with the implementation of a comprehensive home care system for sepsis prevention and management. Cardillo says the leadership for this effort includes HCA member and sepsis clinical leader Amy Bowerman, RN; the Federal/State Quality Improvement Organization’s Sara Butterfield, RN, BSN, CPHQ, CCM; Thomas Heymann of Sepsis Alliance; and Ciaran and Orlaith Staunton of the Rory Staunton Foundation. The HCA’s system for sepsis prevention includes a sepsis protocol, screening tool, and algorithm for the home health care system. It also includes an adjunctive patient education tool. Together, Cardillo says, these instruments form a community-based screening, education, and intervention system to combat sepsis. In New York, protocols for the hospital sector for early detection of sepsis in children were already being led by Ciaran and Orlaith Staunton. Their son, Rory Staunton, was a 12-year-old from Queens, New York, whose death from sepsis created a movement to address the issue of early recognition. The Rory Staunton Foundation was established in 2012 with the overriding goal that no other child or young adult dies of sepsis. Those efforts led to some important new protocols. On January 29, 2013, New York Governor Andrew Cuomo announced that all hospitals in New York State would be required to adopt evidence-based protocols for the early diagnosis and treatment of sepsis, known as Rory’s Regulations. Cardillo says that these existing protocols were taken into account with the development of the HCA’s system for home health care. In order to see nationwide change, it’s important that more providers follow suit. Sepsis deaths are preventable, but only if caught early, making proper protocols vital. The Sepsis Alliance website (sepsis.org) also has educational materials for everyone along the continuum of care—from patient to family to long term care facility—and more. Molander says the alliance frequently host webinars to help get critical information out there. “If your long term care facility is trying to set up a sepsis prevention program, we have a free sepsis care coordinator network where they can ask questions of other facilities that are further along in the implementation process,” Molander says. Inquiries can be sent to sepsistool@hcanys.org. — Lindsey Getz is an award-winning freelance writer based in Royersford, Pennsylvania.